new to the forum, I have some sort of Magicinfo Knowledge by working with it for a year now. While trying to create a new playlist for one specific screen and searching through the UI for quite some time, I clicked "Device Conversion" in the device List. Because I did not have any Lite Licenses, I added the 25 free licenses. Same result unfortunately. Any support would be greatly appreciated! 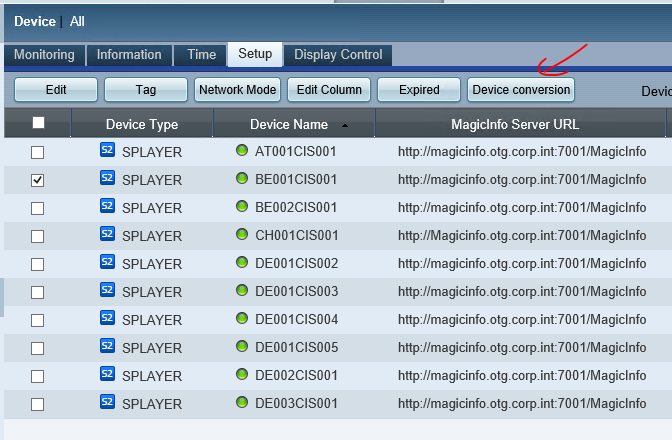 i have magicinfo server v2, but had same experience, with my sbb i-player. I needed to change its group, and unfotunatelly, maybe it is bug, i could do it anyway, so i needed to delete it and add it again in correct group. Then adding same as you - no device in unapproved list. Didn't do the restart bit yet, I'll try that when back in Office Thx! Check your firewall settings, it could be that port 7002 and 7001 is blocking the communication between the screen and the server. As mentioned before, try connection without your firewall.